← How to convert pcl to pdf and rotate the page? If you are looking for an Acrobat alternative, and the quickest way to convert EMF to PDF and edit PDF subject, you should try VeryPDF HTML Converter Command Line. VeryPDF HTML Converter Command Line has the capacity to convert EMF to PDF and edit PDF subject in a very quick and fast way. To be more exactly, it only requires two steps to help you solve the problem. You should begin with opening the command prompt window. When the command prompt appears on the screen, you can type a command line in it. If you have no idea what should be included in the command line, you may need to take a look at the following command line syntax. The angle brackets are used to enclose essential contents. string refers to a character string. For example, the command line below can be used to convert EMF to PDF and edit PDF subject. 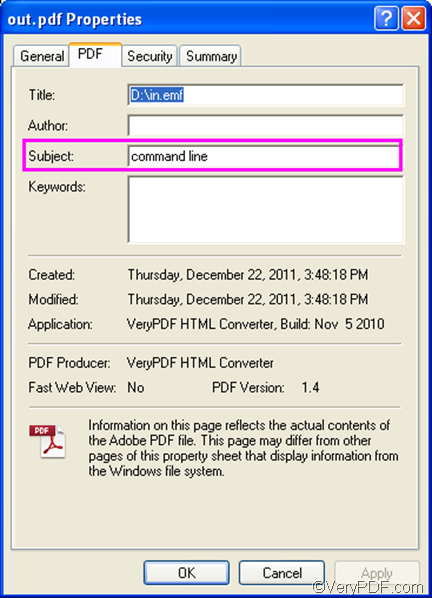 -subject "command line" ---- The option and its value that can be used to edit PDF subject. It defines the PDF subject of the output file as "command line”. D:\in.emf ---- The directory of the input file. It represents the EMF file named in on disk D.
After you type the command line, please press “Enter”. The computer will begin to covert the EMF to PDF and edit PDF subject right away. You can also check out conversion status in the command prompt window. When you see “Result=OK” displayed in the command prompt window, that means the job is done. How to find the result after edit PDF subject and convert EMF to PDF? To check the result after edit PDF subject and convert EMF to PDF, you should right click the icon of the output PDF file, select “Properties” on the menu to open the “Properties” dialog box, > click the “PDF” tab, then you can find “command line” in the “Subject” dialog box. You can try the command line application of VeryPDF HTML converter for 50 times. If you want to buy it, please click Purchase. This entry was posted in VeryPDF Blog and tagged edit PDF subject, emf to pdf. Bookmark the permalink.